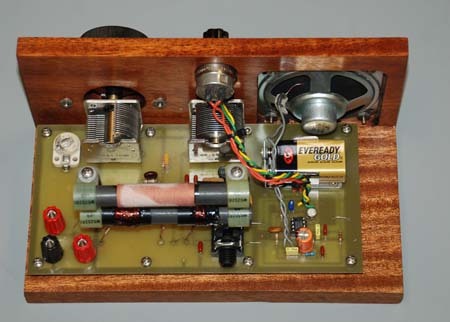 As a youngster I made several crystal radios1 and one-tube radios, and various amplifiers and many transmitters (mostly illegal!). I even made a special five-tube radio designed to mount in the steering column of a 60 Series scooter. It worked swell, but the filaments all fell out of the tubes after about 5 miles on that rough scooter. 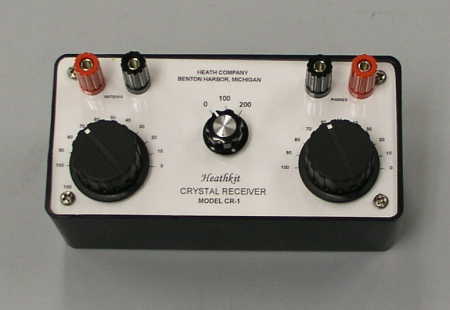 Since then, both in business and as a radio amateur, I have designed and built a multitude of receivers, transmitters, and other electronic equipment, but I never forgot my early fascination with the crystal set. More information about crystal sets appears at the bottom of this page. This page is arranged with my latest Crystal Radios at the top, and working down through time to my first radios. I enjoy making these little radios and I usually spend several times as long in the design and layout stages as I do actually constructing the sets. All my sets are fully designed first on paper, then in a computerized drawing (CAD) program. All panels and chassis holes are drilled using computer coordinates on a mill. At assembly time it is a lot like building a Heathkit™ product. My latest set uses a Schottky diode, a FET and a LM386 audio amplifier. It has minimum loading on the tuned circuit for maximum selectivity. It can directly drive sound powered phones or almost any low impedance earphones or earbuds. It will also drive an 8 ohm speaker to room volume. The gain of the amplifier can be changed from 30 to 100 with a small pot on the board. A gain of 30 is entirely sufficient for use with earphones, but speaker performance can be enhanced with increased gain. It is very similar to my previous radio below except it does not have the three band audio equalizer. 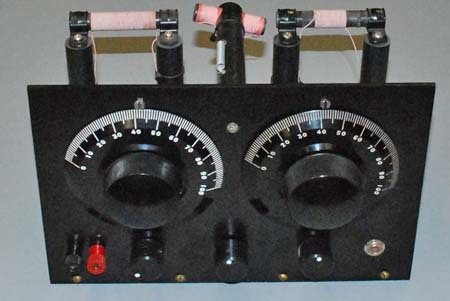 The front panel controls include tuning and volume controls and a knob that turns a shaft to raise or lower the coupling between the antenna and detector coils. Also on the panel are two phone or speaker jacks, one standard 1/4 inch and one 1/8 inch for miniature earphones. The antenna input is located at the rear of the set. The diagram of this set is shown at the bottom of the Crystal Set Tips page and a printed circuit board layout is available if you wants to build one. 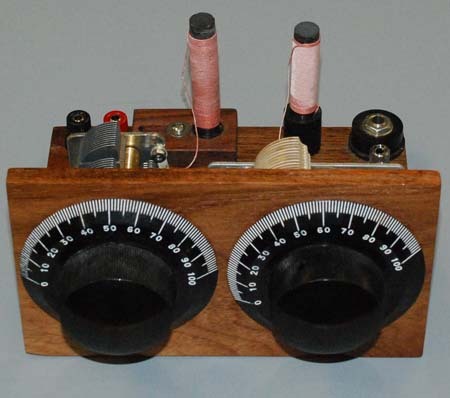 For my next crystal radio I wanted something very unusual and unlike any crystal radio ever made. I came up with a design that has a three band audio equalizer and enough gain to drive a speaker. The equalizer provides 20 dB of boost or cut centered on approximately 100, 800 and 3000 hZ. All circuitry, except for the front panel controls, is located on a printed circuit board. It uses a Schottky 2082 diode detector followed by a 2N5483 FET source follower. The extremely high impedance of the source follower insures minimum loading on the detector for good selectivity. The source follower feeds the first LF353 amplifier running a gain of 20X, then to a second LF353 configured for unity gain which drives a three band LF353 graphic equalizer with active feedback. And, finally, the graphic equalizer feeds a 500 mW LM380 speaker or headphone amplifier with a gain of 30X. A front panel volume control is connected between the output of the first LF353 amplifier and the input of the LF353 source follower. Individual gain trimming pots are provided on the output of the 2N5486 FET and on the LM380 speaker amplifier board. 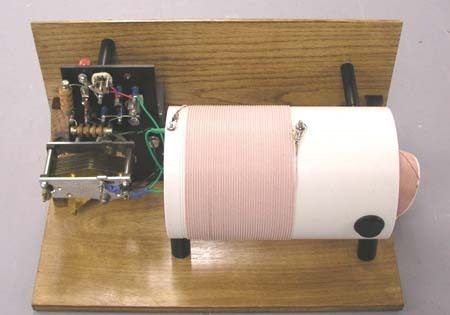 The detector coil is 100/46 Litz wound on a 1/2 by 4 inch ferrite rod and has a Q of about 700. Originally the antenna input was a three turn link on the cold end of the detector coil. The sensitivity was good, but some of the stronger local stations were unusually broad, probably from the proximity of the link to the coil winding. I found that when I added a second ferrite coil of about 300 uH, spaced about an inch away from the detector coil, with the antenna and ground connected across it the sensitivity was about the same, but the locals occupied less bandwidth. This coil can also be rotated to adjust the coupling if desired. With a normal length antenna it is self resonant below the broadcast band so that no resonant peaks appear in the operating band. The off/on and volume controls, and the bass, mid range and treble controls are located on the front panel. Most AM stations do not have much low frequency content, but occasionally I find some music and the bass boost is awesome when I listen to it with my Bose QC25 earphones. The mid boost and the high boost both have proved very useful for tailoring the audio response to help identify weak stations. 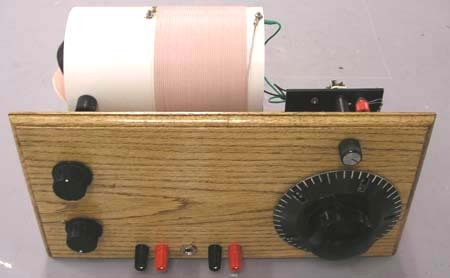 It is the most sensitive crystal radio I have ever made with a minimum discernable signal of about 25 microvolts. It has excellent adjacent channel selectivity except at the very top end of the band where there are several strong local stations close together. In the evening I can tune in lot of stations up as far as New York. I usually receive WSM, WHAS, WABC, WWL, and many others most evenings. This radio is special. Built in April, 2013, it is designed to receive the frequencies below the broadcast band. Between 198 kHz and 530 kHz are a multitude of low power aircraft beacon stations. Most run about 15 watts of power with very small antennas. But, despite their low power they really get out because of the low frequencies they use. Also, there is instant gratification because they all send their call letters continuously and you immediately know who you are receiving. A list of the beacon stations is available at http://www.dxinfocentre.com/ndb.htm and at other sites. Europe has a broadcast band around 170 kHz, but it probably would not be receivable on a crystal set. Perhaps it could be received by someone on the East Coast of the US. This radio has two bands, the first from 540 kHz down to 190 kHz and the second from about 450kHz down to 160 kHz. (It takes a lot of added capacity to go just a little farther!) I made it come up to 540 kHz because I have a local station there and I can use it for verification that all is OK. 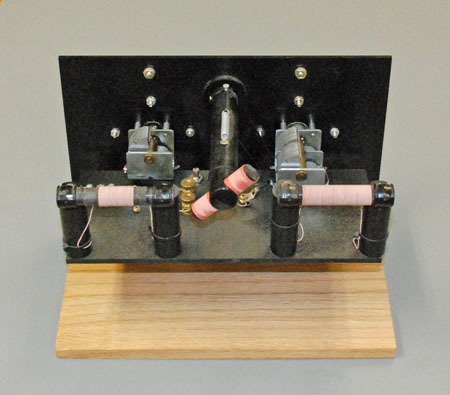 It has both variable antenna coupling and the Hobbydyne™ coupling circuit. I have received about 25 beacon stations to date on this set and the prototype set I was using for a couple years prior to building this one. My best DX is North Carolina in the middle of the afternoon. There was an article about my crystal set beacon reception in an issue of Monitoring Times last year. Monitoring Times is my favorite magazine. If you are not familiar with this magazine you should check it out. Note: Monitoring Times magazine has been replaced by The Spectrum Monitor, an Internet only magazine. This set is an exact 80 percent size copy of the Hobbydyne™, with added refinements. 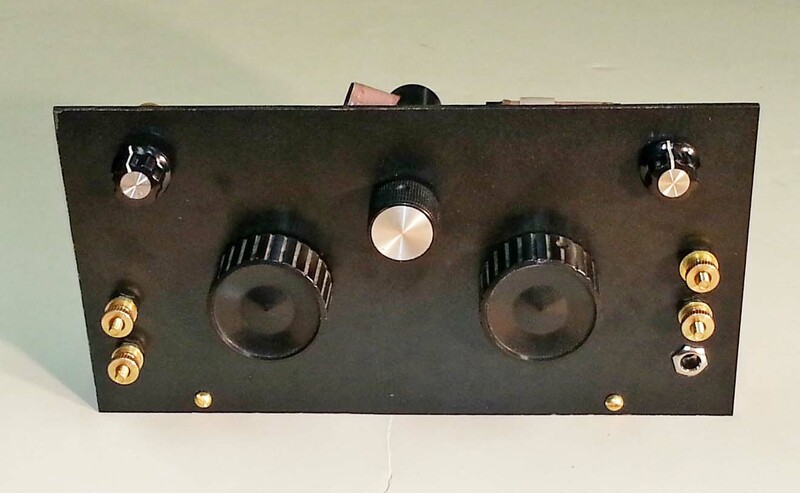 I had two smaller Miller military style vernier dials I wanted to use, but they were too small to look good on the standard size Hobbydyne™ front panel, so I scaled the panel down to match the knobs. 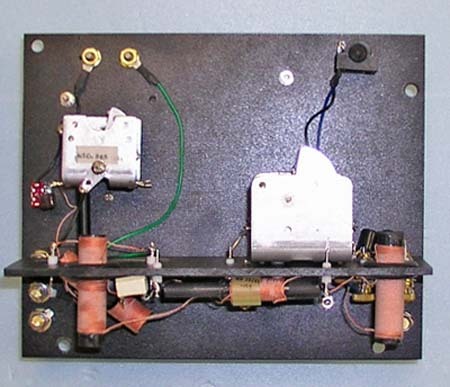 This one has variable coupling for the antenna, and a fully frequency compensated Hobbydyne™ circuit. 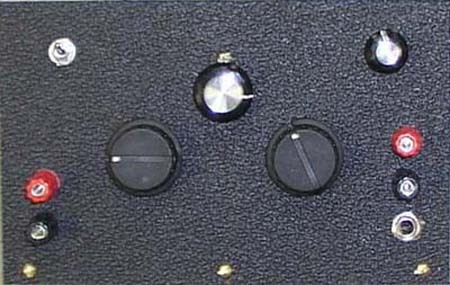 These particular National dials have to be rear-mounted - they cannot be installed on the front side of the panel like the regular National dials. This presented a problem in construction since if the dials were mounted to the rear of the panel there was no way to mount the tuning capacitors. This was solved with a sub-panel about an inch behind the main panel and a sub-miniature shaft coupling. The tuning capacitors are mounted to the sub-panel. The panel also serves as the mounting base for the choke, the compensating capacitor, plus the resistor and capacitor for the "Benny" Made in April, 2013. The knobs on this set were homemade from black Delrin rod. They are knurled around the perimeter for a nice hand feel. 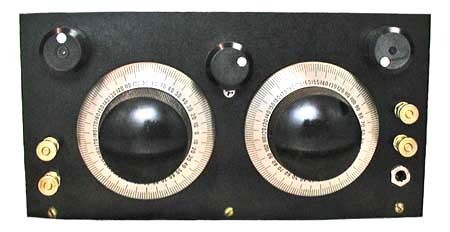 The original knobs were the standard rounded ones used on the larger dials. My knobs have a nice military appearance which I like better. We are selling the little Hobbydyne™ kit again. This is the prototype of the second generation kit. The dimension of the panel were chosen so that 3 inch National Velvet Vernier Drives can be used with it if desired. 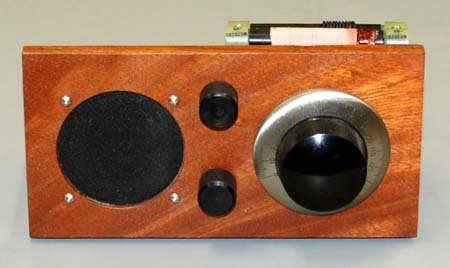 The kit is sold complete, with a drilled front panel and all components and hardware except for the knobs and the wood base. Suitable knobs can be found on eBay, or at Radio Shack. 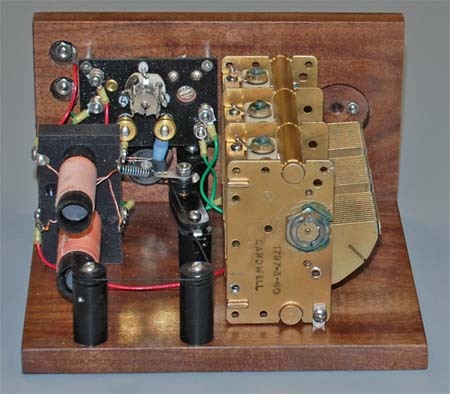 This is a very selective crystal radios with both variable antenna coil coupling and the Hobbydyne coupling circuit. The switch is to add capacity to resonate smaller antennas. This set was made in February, 2013. To inquire about purchasing this set send an email to me at the address listed below. This set was built in November, 2012. It uses a very high Q Spider Coil. The coil is wound with 660/46 Litz and the Q is in excess of 1000, too high to measure on my HP 4342A Q Meter. The radio has only one tuned circuit, the spider coil using a "Holy Grail" silver and ceramic variable capacitor. The antenna is coupled to the spider coil with the smaller non-resonant spider coil. This coil resonates below the broadcast band, if it resonated in the band it would try to inject stations at its resonant point. The selectivity of this set is very good, using the Hobbydyne™ coupling circuit to the detector. It is a pleasure to tune because there is only one adjustment. This set was finished in late October, 2011. I have had a Tivoli AM/FM table radio in a very attractive walnut cabinet for several years. I kept looking at it, secretly wishing that the circuitry would fail so I could build an crystal radio in its beautiful cabinet. Well, it happened - the polycon variable capacitor broke. I suppose I could have returned it for repair, but I decided to do what I had wanted to do for years - steal its cabinet, speaker and speaker grille. 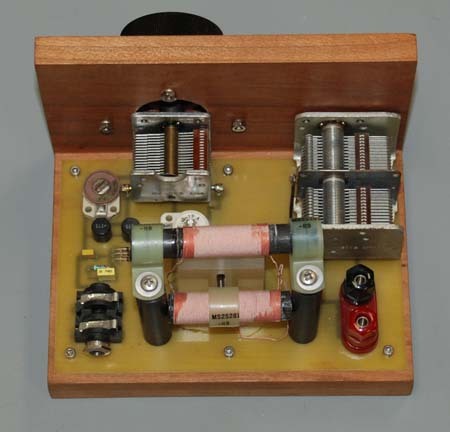 The circuitry of this set is identical to the antique set directly below, except that the fixed antenna coil setup worked so well in the Antique Set that I did not install an antenna tuning capacitor in this one. I also used the Tivoli super high quality speaker and left its bass port in place. I called it the "Model One" in honor of Tivoli who also used that model number. I used a 6 dB bass boost circuit on the LM386 amplifier and it really sounds good. 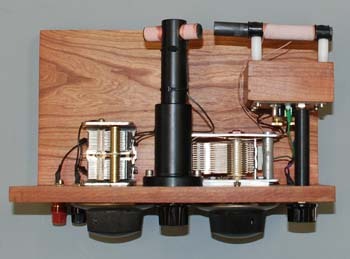 The bass port is mostly hidden in the picture by the shorter antenna coil. 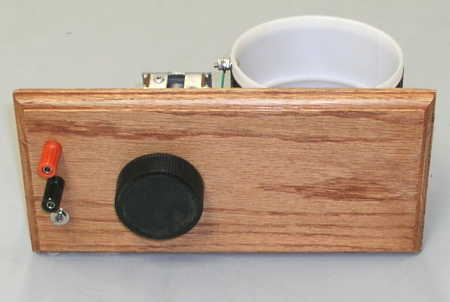 The printed circuit board is mounted atop a shelf and under the shelf is the 9 volt battery. It is accessible through a door on the rear panel. The chassis slides into the walnut cabinet and is secured when the rear panel is attached with the four mounting screws. The knobs are homemade from Delrin rod and are knurled for a nice feel. This set also has adjacent channel selectivity. It is also extremely sensitive. Last night I received WLS in Chicago, WBT in Charlotte, NC. WWL in New Orleans, LA, WSM in Nashville, TN, WPTF in Raleigh, NC and WOR in New York City, plus a lot more not identified. Incidentally, the Tivoli is an excellent little AM/FM radio and it has my highest recommendation. It is available in monorail and stereo versions I have four Tivoli radios in my home and workshop. This set was made to look a lot like the old 1915 crystal radios that my Granddad made and sold to jewelers all over the northeast. Actually, it cheats a little because it has a FET transistor isolation stage and a LM386 amplifier so that I can power a speaker as well as earphones. The case is made of solid 1/2 and 3/4 inch cherry wood. The circuitry is all on a printed circuit board. The radio, finished in early September, 2011 offers the user a choice of a conventional two-coil crystal set, or it can be switched to series resonate the antenna coil with the antenna capacity to just below the broadcast band. Below the band is necessary because if it is resonant in the band any station on its resonant frequency tends to bleed over a portion of the band. Tuning the coil adds a little more sensitivity, but it is not really needed because it can receive down to the noise level with the fixed input. 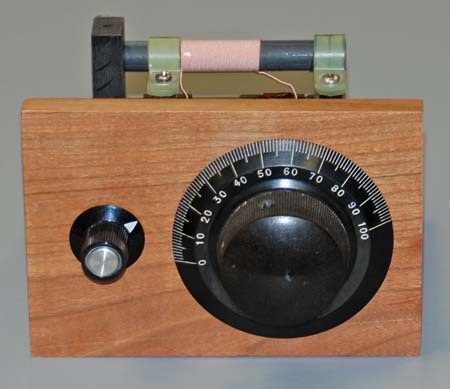 The single knob tuning with the fixed antenna coil simplifies using the radio, and as a bonus the detector dial can be calibrated accurately since it is no longer affected by the changing antenna coil. A small link coil wound on the cold end of the detector coil could also be used to connect the antenna in place of the fix tuned ferrite rod coil. A link does not give as good a sensitivity as the ferrite rod coil spaced about 1.5 inches away center to center, and the added capacity introduced between the link and the detector coil causes strong local stations to occupy too much of the dial. The antenna coil is 350 uH wound with 100 strand #46 Litz on a 4.5 inch long .710 inch diameter Delrin form with a 4 inch by .5 inch ferrite rod inside. The form was threaded to give a a spacing of .010 between the turns. Its Q is 650. It is mounted on a sliding track so that the spacing between it and the detector coil can be changed easily. The detector coil is 183 uH, wound with 170 strand #46 Litz and the turns are spaced .015 inch apart. Its Q is 780. 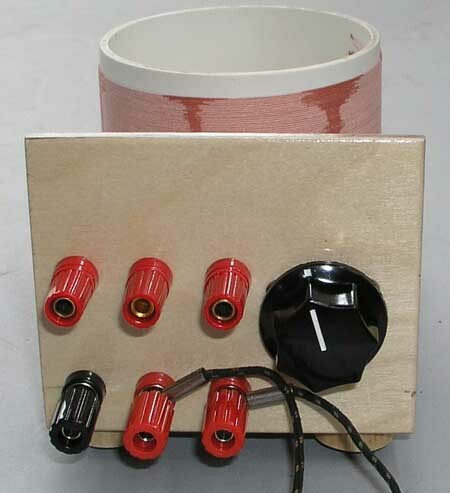 The tuning capacitor for the detector coil is a 500 pF military surplus ceramic insulated unit. The antenna tuning capacitor is a conventional two section 365 pF variable. The cathode of a the Hobbydyne™ circuit diode is directly connected to the gate of the 2N5486 FET transistor. The output from the FET is taken from its Source lead. This accomplishes two things at once. First, the input coil is isolated for minimum loading because of the two megohm input impedance of the FET stage. Secondly, the Source output of the FET is a low impedance and it is capable of driving any earphones, 2000 ohm or sound powered low impedance phones without the use of a matching transformer. Except near a strong local daytime only station, it offers adjacent channel selectivity anywhere on the band. This radio was far more challenging to me for its cabinetry than for its electronics. The circuit this set uses, known as the "Homodyne", was invented in the early 1920's about the same time as the invention of the Superhetrodyne. It never became very popular because it was inferior to the Superhet, but nevertheless it is a fine performing circuit. A two part article on this modern two-transistor version was published by G.W. Short in The Radio Constructor, a UK magazine in 1972. The Homodyne is a regenerative receiver. It is unusual in that the feedback is not obtained by the usual feedback coil, but is obtained by taking the signal at the output of the second transistor (which is back in phase) and feeding it back in a controlled manner through a limiter and a potentiometer to the input of the first transistor. I made several changes to improve the performance of the radio. First, I use a 20 turn winding adjacent to the tuning coil to feed the gate of the first transistor. This reduces the loading on the tuned circuit, improving the selectivity. Second, my antenna coil is on a separate ferrite rod spaced an inch away from the main coil. This provides the same sensitivity as a winding on the main ferrite rod, but eliminated the capacitive coupling which would exist with the coils close together. The true inductive coupling, with no capacitive coupling, provides additional discrimination against the strong local stations. I changed several values in the feedback circuit because of the lower inductance of the 20 turn link. All of G.W. 's circuitry is on the left printed circuit board in the picture. The output of G.W. 's circuit is designed to power a pair of headphones. 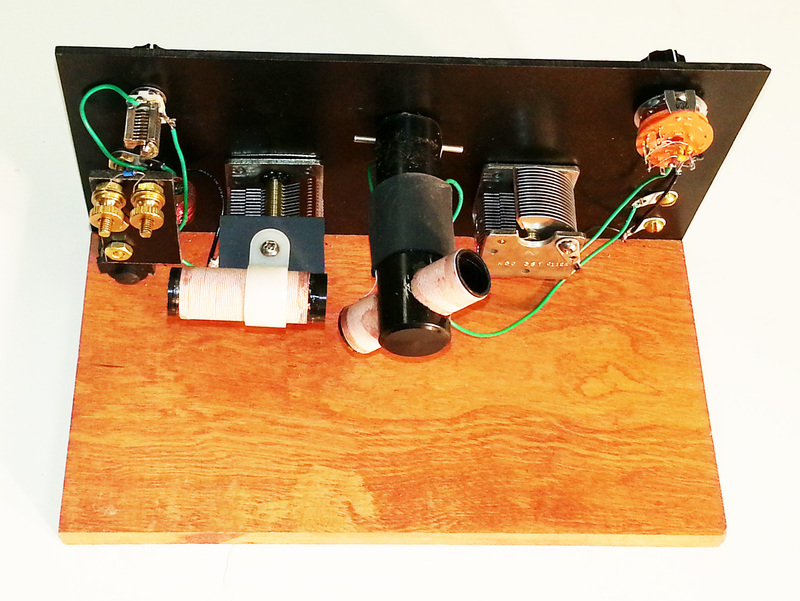 I added the board to the right, a 500 mW amplifier using a 386N, to drive the 3-inch speaker. I could not find either of the transistors used in the article. I substituted a 2N5486 for the FET transistor and a 2N3638A for the PNP transistor. I built this set in February, 2011. The set is a more sensitive than the conventional regenerative sets shown below. With no antenna this set will receive quite a few stations, a couple over 50 miles away. When on an outside antenna there is little noticeable difference between the two versions because they both offer more than ample sensitivity. The Homodyne is much nicer to use however, since once the regeneration control is set it does not have to be changed. To read G.W's original article click here. 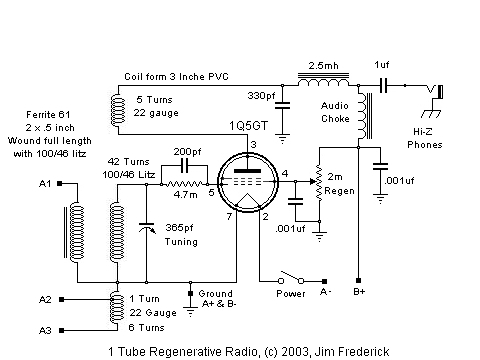 Here is a variation of my previous FET regenerative radios, pictured farther down this page. The detector portion is very similar, but this one has an IC audio amplifier and a front panel speaker all on the same PC board. It also has an earphone jack. Plugging in the earphones disconnects the speaker. Regeneration is very smooth like the previous FET set, and sensitivity is exceptional. A small amplifier using the LM386 chip drives the speaker to about 400 milliwatts, plenty for good room volume. 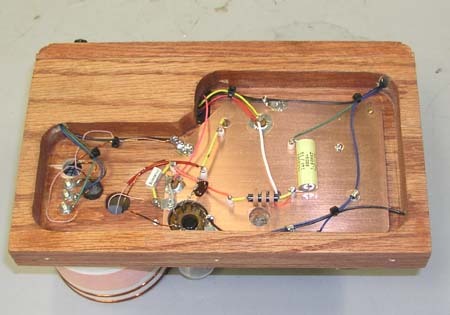 An electronic bass-boost circuit is employed and makes the 3-inch speaker sound pretty good. It runs on one 9 volt battery. Note that the feedback winding and the antenna winding are on a separate ferrite rods about an inch away from the main coil. This one was made in January, 2011. This set is similar to the one above. 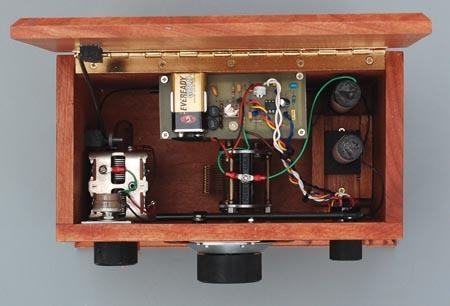 It has a 2-inch speaker and its speaker amplifier is on a separate board. It was made in January, 2011. This set, made in September, 2010, has its electronic components hidden inside a small walnut box. It has variable coupling between the coils and the Hobbydyne™ variable capacitive coupling capacitor located on the front panel. The panel and base is solid walnut. It has a military surplus silver plated tuning capacitor on the detector side and a standard two gang 365pF variable on the antenna side. This is another small double tuned crystal set made in 2010. It has my usual Hobbydyne™ capacitive coupling circuit and fixed primary and secondary coils. The Hobbydyne™ capacitor is on the PC board on this set, and is adjusted for optimum selectivity. This is another in my "simplicity" series. It works great, and has good selectivity due to the ™Hobbydyne coupling and the very high Q ferrite antenna and detector coils. Pictured here is a regenerative receiver using a MPF-102 JFET transistor. For a clean look only the tuning and the regeneration knobs were mounted on the front panel. The off-on switch, the phone jack, and an on indicator LED are located on the back. The set uses two 1/2 inch by 4 inch #61 Ferrite rods separated one inch center to center for the coils. 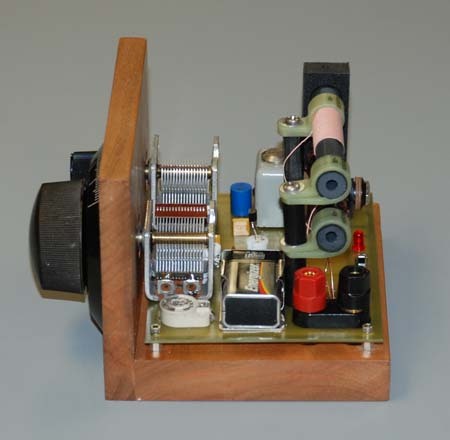 The main tuning coil is wound on the top ferrite rod with 100/46 Litz. The unloaded Q of this coil is 760. The regeneration feedback winding and the antenna winding are at opposite ends of the lower rod and are wound with #24 copper. The windings on the lower rod are wound on sleeves that allow moving them independently across the rod to vary the coupling. During testing the feedback winding was moved to the spot that provided the best overall feedback. The antenna coil is not critical and it works well anywhere on the rod. The antenna coil was originally wound beside the main tuning coil on the top rod, but the set had more selectivity and gain with the winding relocated to the bottom rod. This set is unique because is entirely printed circuit construction It has no connecting wires - no wires at all except the leads from the coils to the PC board. A variable resistor from the Source of the FET to ground provides a gain adjustment. Mostly it just increases or decreases the earphone volume; it has little to no effect on the sensitivity or selectivity and affects the feedback only slightly. Best performance does require some resistance here, the set does not work well with the Source directly grounded. The LED is the biggest power user a just over one milliamp. The FET current draws in the microampere range. The set is powered from an on-board 9-Volt battery which should run this set for a very long time. In the rear picture you can see the battery, the antenna posts at the left and the earphone jack at the right. It uses an antique UTC HVC-5 adjustable iron core choke to isolate the DC from the audio. I was amazed at the performance of this little set. It is very sensitive, very selective and the feedback is very smooth. It works the pants off of my tube type set using a 1Q5GT that is pictured farther down this page. It gets all the local stations and a couple in Tampa, about 50 miles away, using only the ferrite rod. When using only the ferrite rod (no loading from an antenna) the coil Q is extremely high and the selectivity is so sharp that it is hard to tune in a station even with the National Velvet Vernier dial. It is also extremely directional in this mode. With an outside antenna it pulled in over 60 stations last night. I have several other JFET's to try in this set. If any work better than the MPF-102 I will provide more information. 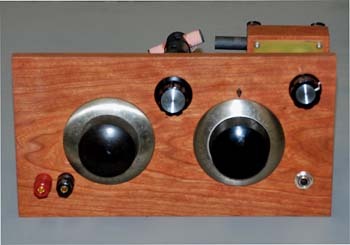 The crystal radio pictured below, built in November, 2008, is a very sensitive and selective two stage tracking set. It uses the conventional high performance antenna circuit (antenna, coil, and capacitor in series) for maximum performance. The Miller crystal set of the 1950's had two coils that track, but the Miller coils are parallel tuned. While the Miller is selective, it is not particularly sensitive due to the way the antenna has to be coupled to the first coil. 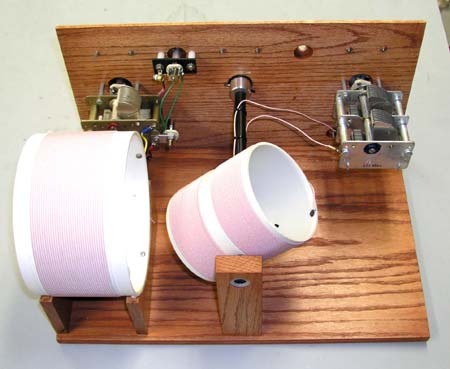 I believe that this is the first tracking crystal radio to use the standard high performance antenna configuration. The antenna circuit tracks with the detector circuit nicely all the way across the broadcast band. 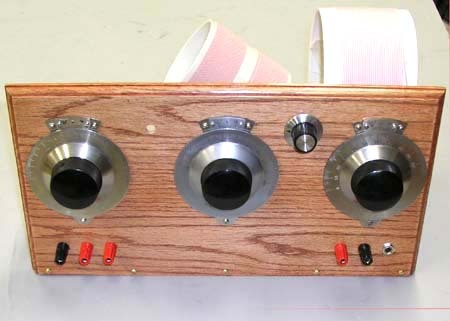 It is a dream to use because only one knob is required for tuning, The usual "pulling" of the detector tuning when the antenna circuit is resonated is completely eliminated. This set is antenna specific - it will track properly only with the antenna that it was designed for. A different antenna requires a change in circuit values, and it may not be possible to accomplish tracking with some antennas, particularly short ones. For this reason this set includes an inductive antenna coil adjustment that allows it to be used with full performance with any antenna. 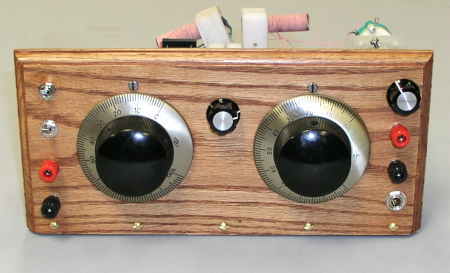 The ferrite core in the antenna coil is adjustable by means of a dial cord arrangement and a knob on the front panel. For my antenna with tracking, I simply set and forget this adjustment. 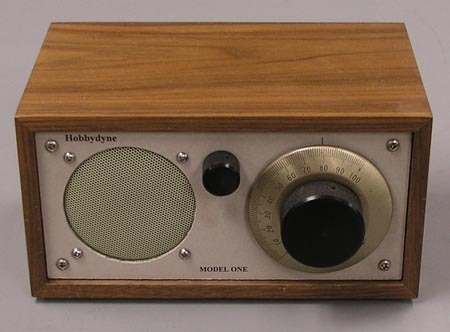 This radio uses the Hobbydyne™ capacitive coupling circuit. A differential capacitor and a small piston trimmer eliminate any frequency change when the detector coupling is adjusted. All the electronics are built on the rear of the small circuit board. 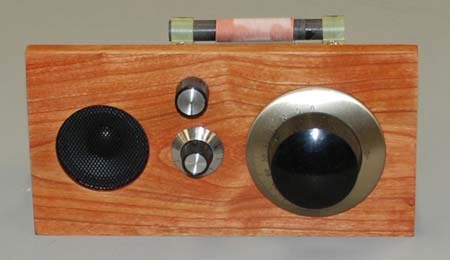 I made this radio in August, 2008. The design objective was to make a crystal set a little smaller than my previous ones, but with no compromises in performance. This set uses two antique 3.25 inch National Velvet Vernier drives. The antenna capacitor is a dual 365 pF obtained from the Xtal Set Society. The loaded Q in the antenna circuit is fairly low, and a quality ceramic insulated capacitor is overkill here. For the tuning stage I used a vintage silver/ceramic TRW capacitor that measures 500 pF. 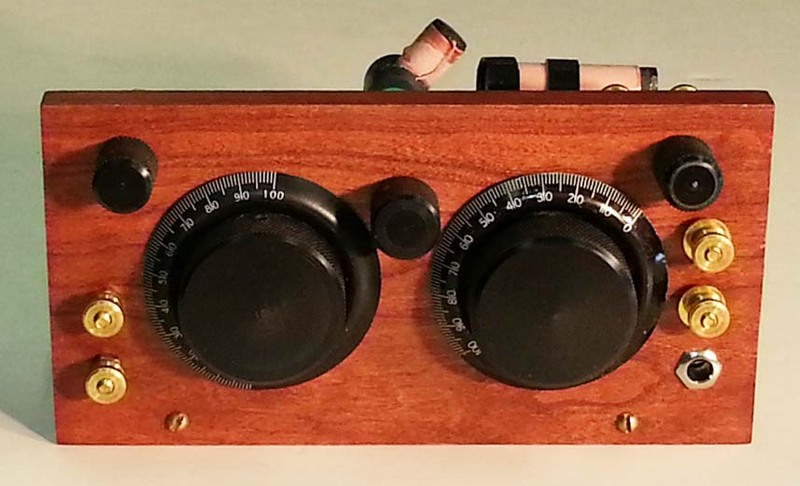 Like all of my Crystal Radios, this set uses the Hobbydyne™ circuit to couple the detector coil to the diode. This time I located the Hobbydyne capacitor on the chassis rather than on the front panel. In practice I usually set the capacitor to the optimum value and leave it there anyway. The set has a ceramic trimmer across the main tuning capacitor so that the upper end of the broadcast band can be calibrated to exactly zero on the dial. 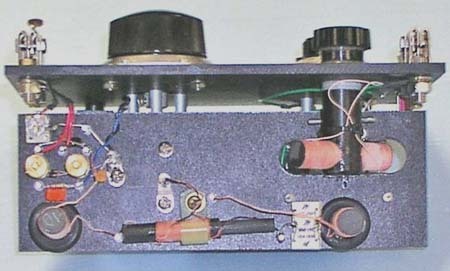 The small toggle switch is used to select one or both sections of the antenna tuning capacitor. The two metal binding posts near the headphone jack are for the Schottky diode. These two terminals and the Hobbydyne™ capacitor are all insulated from the chassis using Nylon insulators. The red and black jacks are for the antenna and ground. The chassis and front panel are both made of solid walnut. They were recycled from a Walnut award certificate I received for selling cellular telephones a few years ago. The front panel was cut down to approximately 3/8 inch thick and the chassis is 3/4 inch thick. To keep things neat all wires run in groves routed on the under side of the board. Both coils are wound on 1/2 inch by 3-inch ferrite cores. The antenna coil is wound with 100 strand #46 Litz and the detector coil is would with 170 strand #46 Litz. The approximate Q's are 550 for the antenna coil and 650 for the detector coil. The detector coil is affixed to the chassis, the antenna coil can be adjusted to provide optimum coupling. I found that inserting the ferrite rod into the wood base for support caused a severe reduction in Q, so Delrin adaptors were made to elevate both coils slightly above the wood. The adaptors press-fit in the wood base; the coils press fit in the Delrin adaptors and are held in place with a drop of model airplane CA cement. All controls except the two tuning dials are on the chassis in order to keep the front panel as small as possible. The headphone jack was deeper than the 3/4 inch base so a Delrin extension was made to space it up slightly. The jack mounts in the Delrin adaptor, the adaptor press fits into a hole on the chassis. The front panel and the chassis were first laid out in a CAD program on my computer. The coordinates provided by the CAD program were then used with a mill and digital readout to drill all holes within .001 inch. This accuracy allows the vernier drives to be hard-coupled to the tuning capacitors with no binding. No flexible couplings are necessary. I finished this latest Hobbydyne™ in April, 2007. It features a HRO dial and gearbox that I picked up on eBay. It also uses an antique Pilot Centragrad 500 pF straight line frequency variable capacitor in the detector circuit. 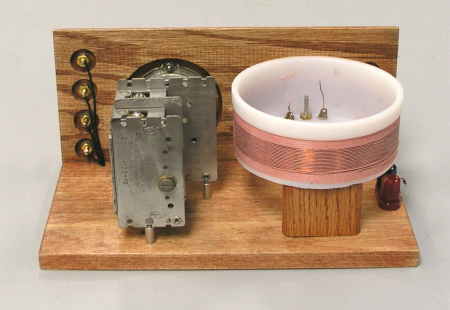 The detector coil is 192 uH wound with 660 strand #46 Litz. The combination provides a band spread of five divisions between each broadcast station, evenly spaced all the way across the broadcast band. Two Styrene sewer couplings were staked together with a short piece of pipe and cement to provide enough length for the detector coil on one end of the form and the smaller 2.3 inch antenna coil inside the other end. The smaller coil rotates with a knob on the front panel to adjust the coupling. A small air variable is used to trim the high end of the band to exactly 1.7 mHz with the tuning capacitor plates fully open. It tunes to down to 530 kHz with the capacitor plates fully meshed. This set uses my Hobbydyne™ circuit with a tiny differential capacitor to enhance the selectivity. In this particular set there is also a small piston trimmer between second set of stator plates and ground to null out any frequency change when the differential capacitor is rotated. The front panel spacing is not as nice as some of my previous sets, but it was necessary for this particular dial/coil combination. This set equals my previous large coil sets in both sensitivity and selectivity. There is no measurable degradation from the use of the smaller size antenna coil. The proximity of the smaller coil to the detector coil causes only a very slight reduction of the larger coil's Q. The Q with the small coil in place tops out my HP Q meter at 1000. The antenna tuning capacitor is one of the tiny two gang Russian military surplus units with both sections in parallel. It requires a turn and a half to go from minimum to maximum capacity and I find this just right for quick, yet accurate trimming of the antenna coil. This set is an absolute dream to tune with all the band spread that it offers. Here is a Close-up of the Circuit Board showing the trimmer capacitor (right), the hobbydyne™ capacitor (center top), and the piston trimmer (to the left of the trimmer capacitor). The insulated plate provides an interface between the HRO dial on the front and the Pilot Centragrad on the rear. The other components are two RF chokes in series, the "Benny", and an RF bypass capacitor. The Pilot capacitor is mounted upside down to keep it farther away from the detector coil. This Crystal Radio, made in June, 2006, I call the Hobbydyne™ Pro. It has two high Q ferrite coils wound with 100 strand #46 Litz wire that track using a dual 365pF tuning capacitor, plus a third independently tuned ferrite Litz wound coil that is variably coupled to the other two. It has better selectivity than any other set I have built. In place of my usual Hobbydyne variable capacitor for adding additional selectivity a two position knife switch, upper right on the panel, is used to select normal or high selectivity. A very small air trimmer is used as compensation to insure that a frequency change does not occur when the selectivity is changed. This allows very precise dial calibration. The large National Vernier dial is used to tune these circuits. Future plans call for a frequency calibration chart in the lid. 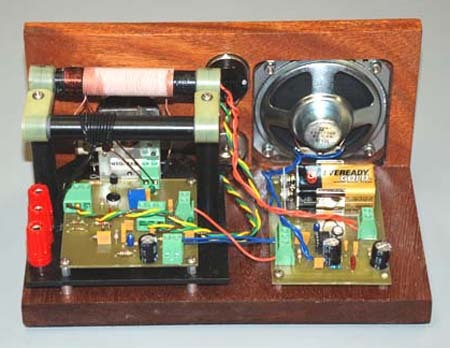 The two tracking tuned circuits use a modified version of the Negative Mutual Inductive Coupling that J. W. Miller used in their 1950's Hi-Fi Crystal Radio Tuner. In this set a ferrite cored mutual inductor is used to allow the coupling between the stages to be adjusted to the desired value. 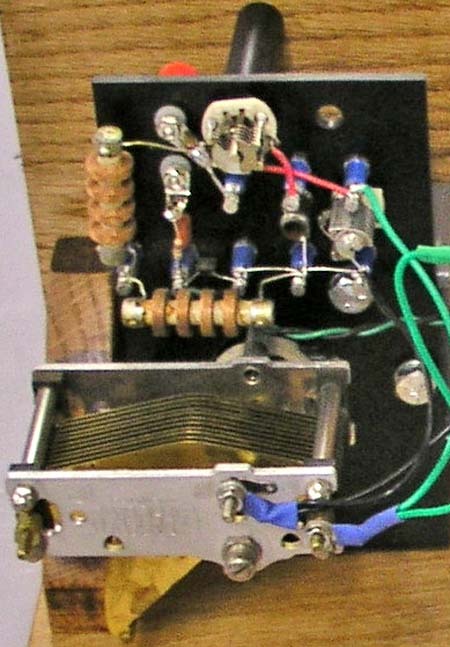 Individual trimmer capacitors are used on each tuned circuit, plus a padder capacitor on one of them to obtain near perfect tracking across the broadcast band. More information on the Miller tuner can be found at the bottom of this page. The third independently tuned circuit used for the antenna input provides impedance matching and additional selectivity. 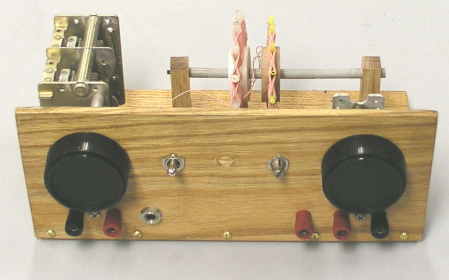 The amount of coupling between this tuned circuit and the following circuits is fully adjustable by rotating the coil with the upper left knob on the front panel. This circuit is tuned by the dial at the lower left. Initially this was a vernier dial. After operating the radio for a while I decided that a vernier dial was not necessary for this stage because faster tuning was desirable, so it was modified to provide a direct drive. 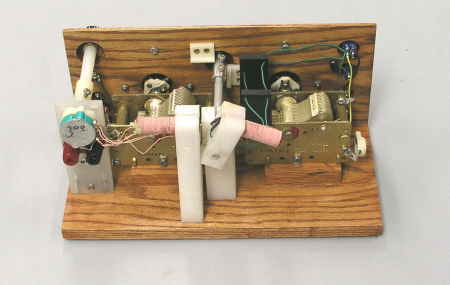 For casual reception the knife switch at the upper left can be thrown to bypass the antenna tuned circuit and connect the antenna directly to a link on the first mutually coupled coil. Both the sensitivity and selectivity are reduced some, but tuning is simplified since only the large National vernier dial is used for tuning. 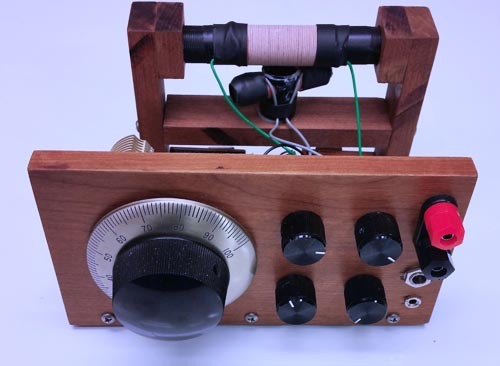 This HobbydyneTM Crystal Radio kit uses the same circuit as our crystal radio that was featured in CQ Magazine, November 2005 pages 79-80. Like our other sets, it uses two tuned circuits with very high Q Ferrite coils. We are now selling this kit again. The kit comes with a drilled front panel and audio board and a preassembled rotary rod, but does not include the National Vernier dials. No knobs are included in the kit, but you can find some at Radio Shack or use the nice National dials shown in the picture. For more information email Jim at the address at the top of this page. Here is a set that I built in 2005. Somehow it escaped the fate of appearing on this web page - until now. It features two large 4-inch antique National Velvet Vernier dials and ceramic insulated variable capacitors from Jackson Brothers in England. It covers the broadcast band in two segments, 530 kHz to 970 kHz and 970 kHz to 1700 kHz to spread out the tuning on the dial. Each segment has a independent air variable capacitor that is used to set the high end of the range. The coils are wound with 170 strand #46 Litz wire on 1/2 inch x 3 inch ferrite rods. The Q of the coils is over 600. The larger coil on the left is the lower range, the small coil on the right is the higher range. The antenna coil is in the middle and couples to both coils. The antenna coupling is adjusted using the lower left knob on the front panel. A dial cord is used to couple the shaft to the rotary rod. The lower center knob is the band switch and the lower right knob is the Hobbydyne™ variable capacitor. The lower three knobs are homemade, the coil supports and the rotary rod are made from Delrin. 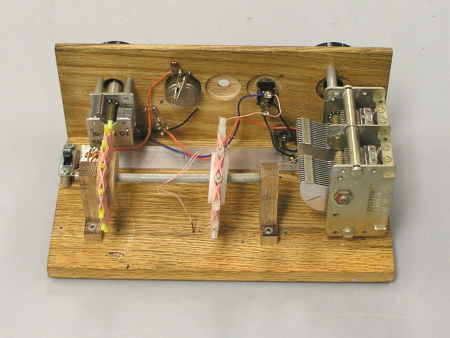 This crystal radio was made in July, 2004. It has a pair of 3.25 inch NOS National Velvet Dernier dials made of bakelite that are over 70 years old. 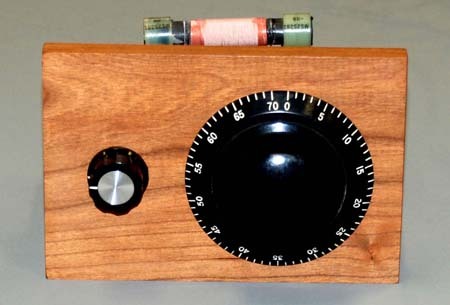 This radio was designed to have a "military" appearance and will be installed on my ham radio table. It has a straight line frequency silver plated ceramic tuning capacitor and the same Hobbydyne™ circuit as my other sets. 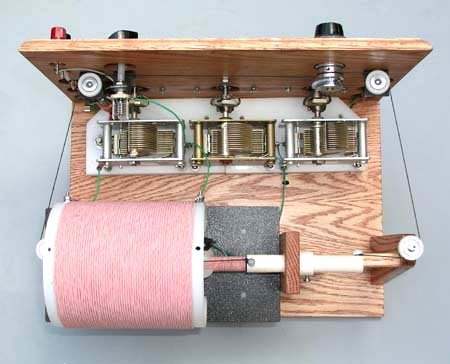 The detector coil turns are space wound with a strand of silk thread between each turn and it has a Q of over 800 at 1 kHz as measured on a Hewlett Packard Q meter. The rotary rod that turns the antenna coil is controlled from the center knob with a dial cord drive. The rear of the drive spool can be seen between the two coils in the second picture. It is very sensitive and selective. This set is featured on page 79-80 of CQ Magazine, November, 2005. Substituting the very expensive 6.5 inch 660/46 Litz wound coils for the ferrite rods gives only a tiny improvement in selectivity. So little difference that it takes a calibrated signal generator to tell if there really is a difference. This set also uses a Schottky diode and the small Hobbydyne variable capacitor for detector coupling. It is designed to work best with an earphone load of at least 100K ohms, although it will work pretty well with plain old 2000 ohm dc headphones. The operational adjustments are the same as the Hobbydyne™ and the Son of Hobbydyne pictured below. Pictured here is my Son of Hobbydyne™. 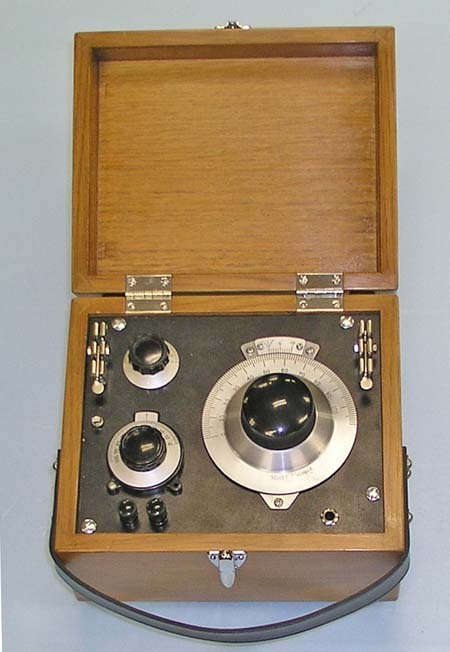 This set was constructed using only parts that are readily available commercially, except the two National dials. It uses quality miniature tuning capacitors with ceramic insulation and 1/2 inch Ferrite rod coils wound with 100/46 Litz wire. 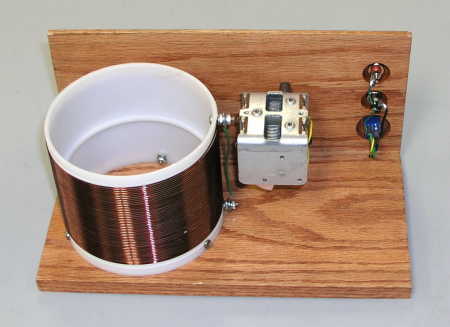 The detector coil is wound on a 3-inch rod, the antenna coil on a 2-inch rod. The Q of the 3 inch rod coil is only about 10 percent less than the 6.5 inch Litz coils in the original Hobbydynes. The 2-inch rod is rotated with a knob on the front panel to vary the coupling between the two coils, and the shorter form was used to hold down the cabinet size. All other components are far enough away from the coils that they have little or no affect on their Q. The schematic of this set is essentially the same as the original Hobbydyne. It uses a Schottky diode as its detector. The detector diode, the bypass capacitor, the DC equalization resistor and capacitor, and the RF chokes are mounted on the small board at the lower left in the rear view picture. I use a pair of WW2 sound power phones through a 150K ohm matching transformer, but it also works well with a pair of quality 2000 ohm (DC) headphones. The extra hole is for a switch to add capacity to the antenna circuit which will be add later. The set is very sensitive and very selective. As the coil coupling is reduced the tuning of both coils becomes very sharp, and the signal will increase when the correct coupling is found. Then the differential detector coupling capacitor can be used for an additional increase in selectivity with very little loss of sensitivity. Using the coil coupling and detector coupling controls, while carefully tuning both the antenna and detector coils can really bring a weak station up out of the noise. 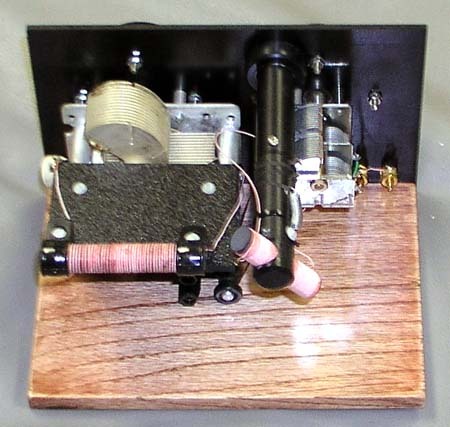 Here are two pictures of my Hobbydyne II crystal radio This set is very similar to the Hobbydyne™, but it uses a second Litz wound coil in the antenna circuit in place of the ferrite rod. This set is a little more sensitive and a lot more selective than its predecessor due to the higher Q antenna circuit, and the ability to vary the coupling between the coils. Both capacitors are silver plated and ceramic insulated, both coils are space-wound on threaded forms using 660 strand #46 Litz wire. The detector coil is 6.5 inches in diameter and has a Q in excess of 1000. The antenna coil is 4.5 inches in diameter with a Q of about 900. When the two coils are rotated to loosen the coupling the selectivity is really sharp. The presently unused control location is for a switch to add capacity to the antenna coil, but this is only required with a very short antenna. The differential capacitor circuit has been changed slightly, and has a second balancing capacitor. With the balancing capacitor there is no change at all in frequency as the detector coupling is adjusted. It uses four Aligent 5082-2835 Schottky diodes in parallel for the detector. 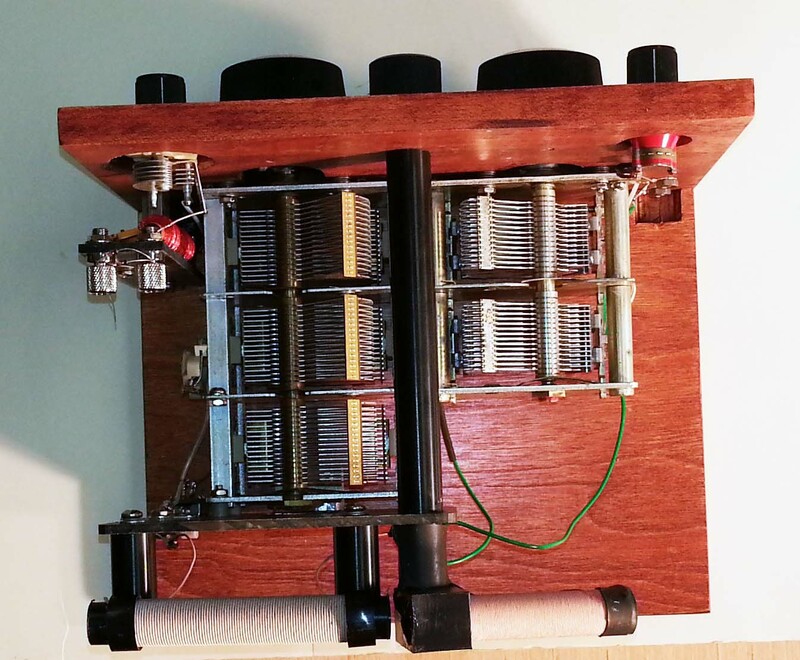 A 200K to 1K transformer feeds a pair of WW2 sound powered earphones. Slightly more sensitive and selective than the Hobbydyne™, it receives about 30 stations clearly in the daytime and many more at night. 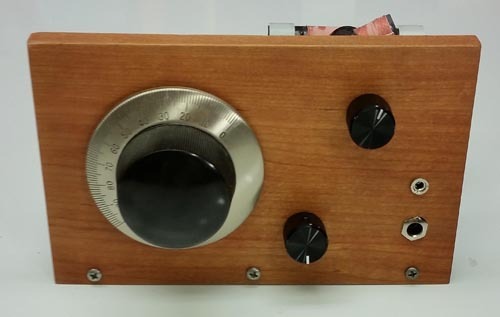 This one-tube radio uses a 1Q5 beam power pentode with a screen potentiometer for regeneration control, just like the one I built in 1950. It follows the classic one-tube radio design from years ago, but has a modern feature or two. If you look in the middle of the coil you will see a 1/2 inch ferrite rod. The coil of Litz wire on this rod measures 250uH and it is used as an auxiliary antenna input coil. The set also has a six turn conventional antenna winding with a tap at one turn. A ground binding post plus three antenna binding posts on the front panel allow the selection of any of the three inputs. The ferrite rod input is superior to the conventional antenna input coils on most antennas, especially at the lower end of the broadcast band. The main tuning coil is wound on a 3 inch ABS sewer coupling from Genoa. It is wound with 100/46 Litz wire at 37 turns per inch. The form was threaded to allow a little spacing between the turns. The other windings are wound with #22 solid which is also 37 turns per inch when close wound. 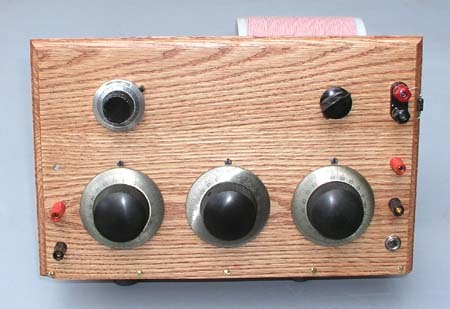 The feedback winding was optimum with only five turns. 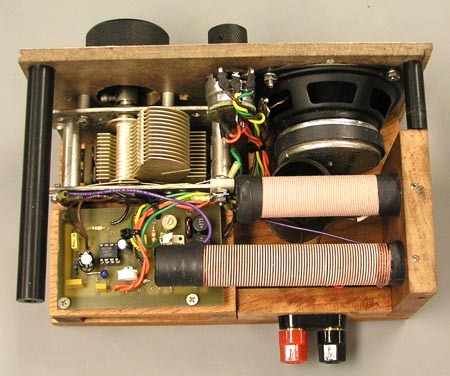 The recess to the right of the tuning capacitor is for a custom made 36 volt battery. The plate circuit is choke coupled to avoid DC voltage across the earphones. It works very well and the regeneration is very smooth. This is the underside picture of the radio. Notice one more modern feature, the printed circuit board that is used as a common ground plane. It does not extend up under the coil to avoid lowering the coil's Q. Feed thru capacitors are staked into the board and used both as capacitors and as connection points. There are also several Teflon insulated posts staked in the board for connection points. 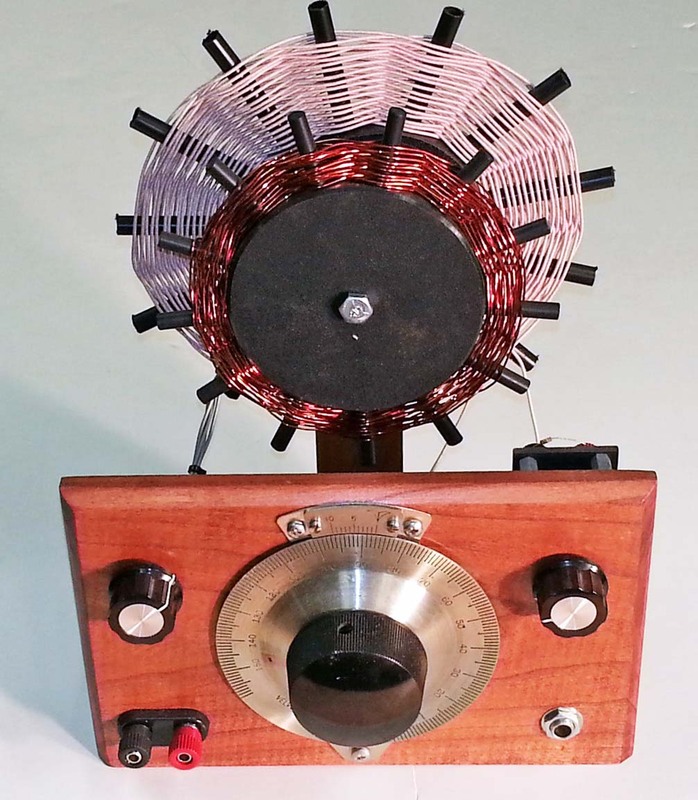 This crystal radio is a homemade copy of the Heathkit CR-1 Crystal Radio from the 1950's. It is built in a 6 x 3 x 2 inch deep plastic box, the same size as the original. 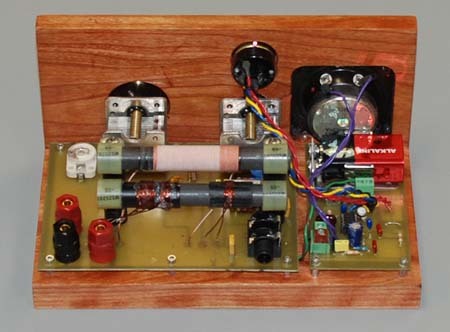 It uses a double tuned circuit with two ferrite core coils and 100 strand Litz wire. The spacing between the coils is adjusted for best performance during assembly. The original CR-1 Heathkits sell for around $200.00 on eBay. That is ironic, because most Heathkits of that area, even the scopes, generators and the like, go for much less. 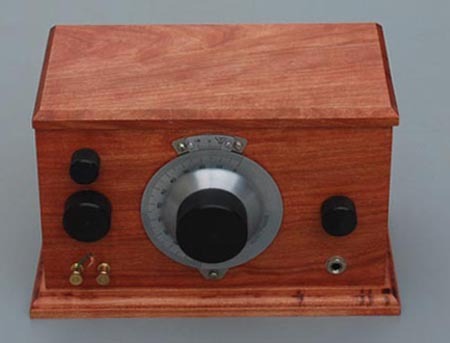 This reproduction Heathkit is featured on page 80 of CQ Magazine, November 2005. Pictured here is my crystal set, that I call the Hobbydyne™. It uses 700 strands of #46 Litz wire on a 4.375 inch diameter detector coil. Seven individual strands of 100/46 were paralleled and lightly twisted in the correct direction. The coil form was made from two Styrene pipe couplings. They were joined and lathe turned to 1/2 their former wall thickness. They are grooved lightly at 19 TPI to give the Litz wire a little space between adjacent turns. The unloaded Q of this coil is over 1000 at 1000 KHz, higher at the low end of the band, and a little lower at the high end. It has absolute single-channel selectivity across the band except directly adjacent to my two local "barn burners" where it has acceptable alternate channel selectivity. Here in Central Florida this set receives 27 stations clearly in the daytime, and almost every assigned 10kHz channel at night. The input circuit has individual tuning capacitors for series or parallel tuning, or any combination of the two. It is similar to the Benodyne. It has two selectivity adjustments. The first is the ferrite antenna tuning coil that slides in or out of the detector coil controlled by a knob on the front panel. The second is a miniature differential capacitor used to couple the detector coil to the diode, also controlled from the front panel. For general listening both of these selectivity adjustments can be pre-adjusted and left in position. For weak DX reception they can be tweaked as necessary. When using series antenna tuning with the antenna capacitor left fully meshed the detector tuning works just like a "real" radio. All 27 daytime stations can be heard clearly. Any chosen station can be further enhanced by tuning the antenna capacitor to resonance at the station's frequency. The diagram below shows a 1N34 detector; it has been upgraded to an Aligent Schotty diode which provided a nice increase in both selectivity and sensitivity. Using a capacitor to provide variable coupling to the detector is not a new idea. In fact, it was used in the 1950's in the Miller Tuner circuit, Set #5 below. For some reason it is seldom used by experimenters, even though it is far easier and works much better than tapping the coil. It does require the use of a good quality RF Choke to provide a DC return for the diode. Although it cannot be seen in the picture, (some parts are hidden in a milled recess inside the white Teflon capacitor base) it has a variable resistor to equalize the AC and DC load for the detector. I retrofitted capacitor diode coupling into my set #3 shown below to replace the taps and the tap switch, and it enhanced its performance. Thanks guys, I borrowed ideas for this set from many of you. Update 8/29/03: For maximum performance at the low end of the band the RF choke should be at least 5 mH, and preferably 7.5 or 10 mH. Two or three 2.5 mH chokes can be placed in series. 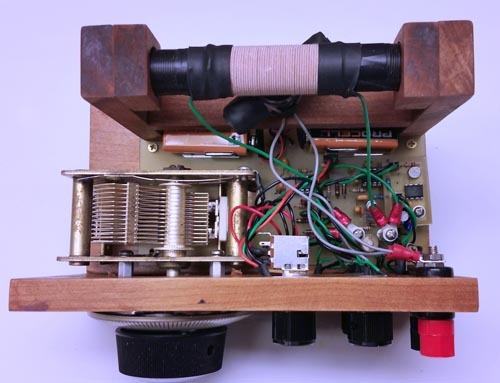 This Crystal Radio built in 2003 adds a few refinements such as ceramic insulated variable capacitors, twin National Velvet dials and ferrite core inductors wound with Litz wire. The unloaded Q of these coils measure well over 400. 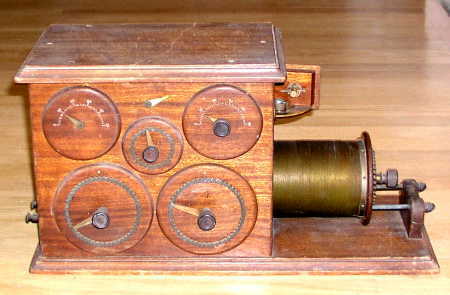 In this set the detector coil has selectable taps to connect the detector circuitry. The front panel knob provides variable antenna coupling between the two ferrite coils. By turning the antenna coil 90 degrees to the detector coil the coupling can be reduced to a very low value. Less coupling means increased selectivity and it helps separate the weak stations from the strong ones. One day I noticed that this set still received a few stations when the tap selector switch was on an unused position. I found that eliminating the taps and adding a tiny differential capacitor and an RF choke for the missing detector DC return made this set receive much better. The Hobbydyne™ circuit was born. 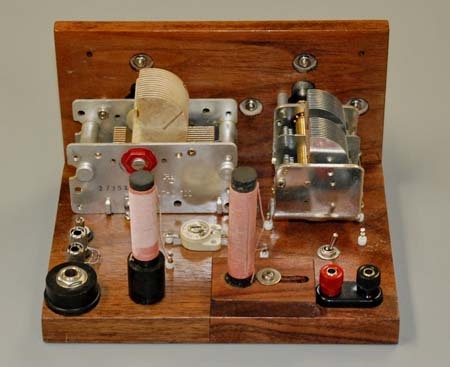 This Crystal Radio was made strictly for nostalgia purposes and it is based upon the circuit of the Mystery Crystal Set which was made famous in Australia in 1932. It is the only single tuned set I have built, and because of this it does not have the selectivity of the other two models, although it does work well. The unloaded Q of its coil is quite high because it is wound on a 4.25 inch Styrene form with Litz wire. The majority of the wiring is concealed in wire passages routed underneath the wood chassis. As an experiment I put an antenna tuner ahead of the Mystery Crystal Radio. The selectivity and sensitivity were both greatly improved, and I decided to built a dedicated tuner for it. The tuner features both series and parallel tuning at the flip of a switch . It has #19 wire space wound at 18 turn per inch on a threaded styrene coil form. Its Q is also extremely high. No connections are necessary between the Mystery set and the Tuner because the tuner was designed to provide correct coupling when the two chassis are sitting side-by-side. 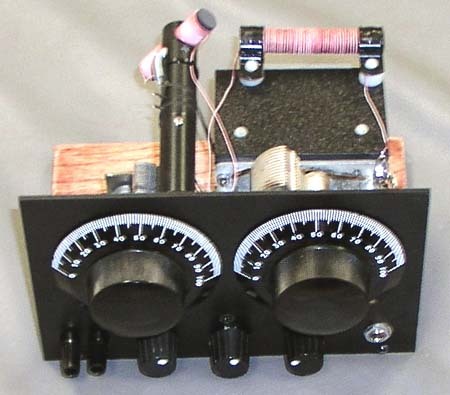 With the tuner the Mystery Crystal Radio is a real DX go-getter and has excellent selectivity. 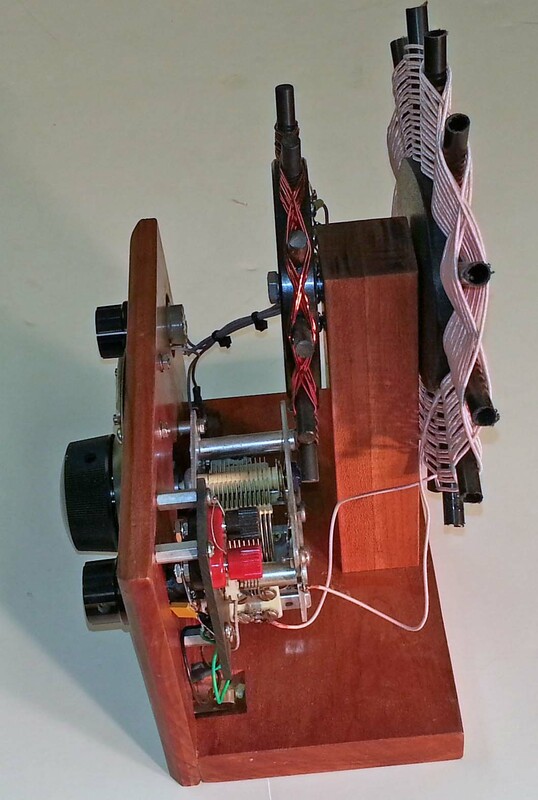 The tuner has it's wiring concealed in routed passages under the chassis the same as the Mystery radio. Extra concealed passages are in place so it can be converted to a stand-alone crystal set very easily. #1 Crystal Radio is my experimental model built in August, 2002. It has had several types of coils including a 2 inch cylinder, a rook which is a variation on the cylinder, a honeycomb and the present radial arm spider coils. I tried coils wound with solid wire and wire with 100 strands of #47 Litz wire. The Litz is far superior, providing a Q (quality) factor almost twice as high on some of the coils. The empty hole in the center of the front panel was the location for a switch that was used to select ten different detector coil taps. One particular tap was almost always gave the best performance. To eliminate any possible loss caused by the large number of coil taps, I rewound the coil with only that one tap. The present coils in this set are radial arm spiders wound using Litz on Teflon hubs with Polystyrene radials. These coils have an unloaded Q of about 285. Note that spacing between the coils can be adjusted. Best overall operation is with the two spider coils spaced three inches apart. When I want to try something new this is the set that gets picked on. It is ironic that the basic circuit I am using is just about the same that my Grandfather, Edwin E. Frederick used in the crystal radios he manufactured and sold in 1914 and 1915. This was long before any broadcast stations existed. His radios were used to receive the Arlington, VA time signal that was operated by the Government. The Arlington time station ran a power of several hundred thousand watts2 on a very low frequency, and it could be heard for hundreds of miles. Jewelers were his customers, and they used the sets to receive the time signal and set their clocks. Jewelers often had crystal radio displays in their show windows and they drew many visitors. Some jewelers even had a ball in their show window that they dropped at noon. Radio was very new and people were fascinated with it. People would gather each day and watch the ball drop. We still have one of his sets, and it is pictured above. The little hinge-out door on the right side is for access to the crystal. I also have several newspaper articles, some customer testimonials, and about 20 hand-drawn diagrams for his crystal radios. Each radio is slightly different from the preceding one. I also have the name of each person who purchased one of his radios, the date of purchase, and the price paid. To see two 1915 newspaper articles and a typical diagram of one of his radios click here. 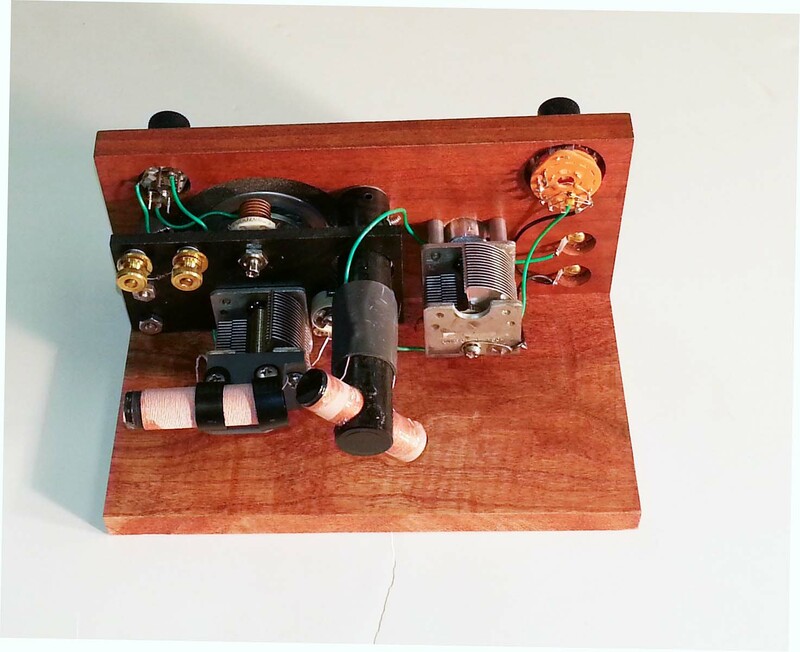 Here is a nice single-tuned Crystal Radio built by Eddie, the great grandson of Edwin Frederick who made the set directly above. Eddie is off to a running start with a 3 inch coil using Litz wire. This is a J.W. 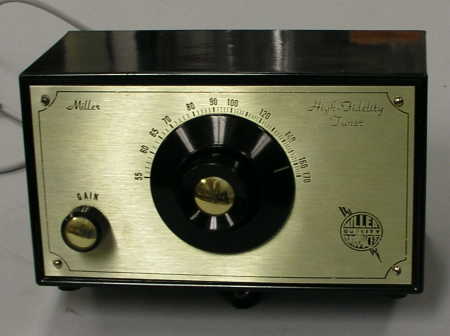 Mller commercial High Fidelity Band Pass AM Tuner from the 1950's. It uses two ferrite coils isolated from each other and coupled by a special "mutual coupling" coil. The result is a set that offers superior band pass selectivity. The two tuned circuits track precisely and it tunes just like any other AM The trade-off is reduced sensitivity, but it still receives stations from all over the southeastern US in the evening from my Florida location using only earphones. 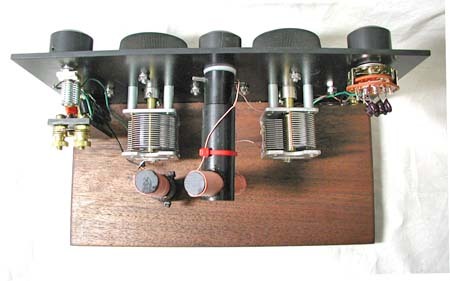 When connected to a high fidelity amplifier like Miller intended the amplifier more than makes up for the slight lack of sensitivity. So, what can I receive with my crystal radios? I live near Lakeland, Florida and during daylight hours I can hear all of the locals and most of the 5000 watt and higher power stations from Tampa and Orlando, both about 50 miles distant. I have also heard WIOD in Miami in the afternoon. Some of the stations, like WDAE, a 5,000 watt station in St. Petersburg are so loud that I need a volume control. WIOD is on 610 KHz and WDAE is on 620 HKz, so you can see that it is pretty selective. In the evening I regularly hear WSM Nashville, WWL New Orleans, WBT Charlotte, WSB Atlanta, a station in Indianapolis, IN, and many more not yet identified, including a large number of Spanish stations. 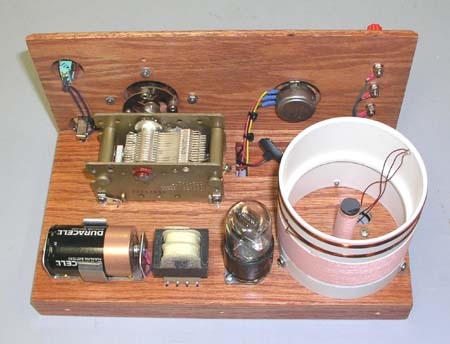 So, the statement that a crystal radio with a decent outside antenna can receive as well as a 5 tube table radios is true. In fact, the crystal set receives better because the table radio picks up so much more electrical noise than the crystal radio's outside antenna does. In 2002 I came across an article about Crystal Radios on the Internet. The person who wrote the article said that a good crystal set with a reasonable outside antenna could pick up almost any station that a five tube table could hear. Well, I figured he was smoking something that I did not have access to. But it did get me interested. I discovered that there are hundreds of circuits and plans for building the little crystal radios, all of which are variations of and improvements to crystal radios made before 1920. The plans range from old copies of Popular Electronics and other hobbyist magazines, the work of Elmer G. Osterhoudt and his Modern Radio Laboratories, to the hobbyist (read Engineers) that are making high performance crystal sets today. 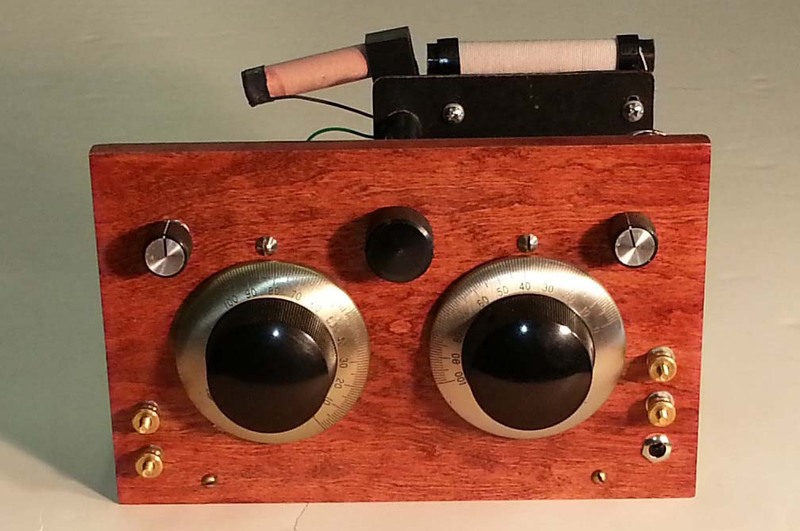 If you think you are pretty sharp on electronics visit Ben Tongue's crystal radio site. I guarantee that you will learn the finer points at this site. In fact, I will not get too technical because it is all covered there. 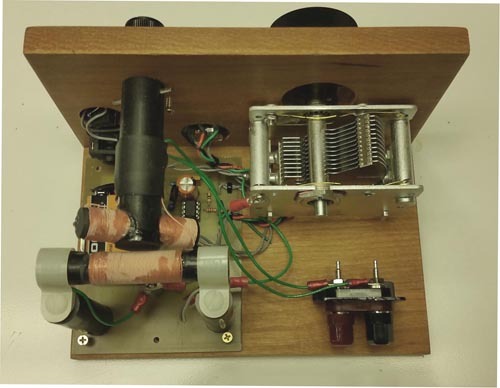 I discovered that designing and building a high performance crystal radio is far more demanding than building a multi-tube radio. With the multi-tube radio cutting a corner here and there will barely be noticed. Every part and parcel of a crystal radio must be perfectly designed if you expect it to work well, since all your operating power comes directly from the broadcast station you are receiving. The earphones used are also very important. Today's earphones are made to be used with powered radios and they are unsuitable for crystal sets. Most people who build crystal sets use vintage Baldwin or Western Electric earphones made in the 20's and before. Personally, I find that of the regular earphones, the Western Electric models 509 and 509W are the best. Despite their age, these vintage earphones can still be found today. The most sensitive and best sounding earphones are made from World War II surplus sound powered elements and most models work better than regular earphones. These elements can be removed from military sound powered handsets or headset for use in custom made headsets. The best sound powered elements by far were made by RCA and are often called "Big Cans". These sound powered elements are hard to find and very expensive. 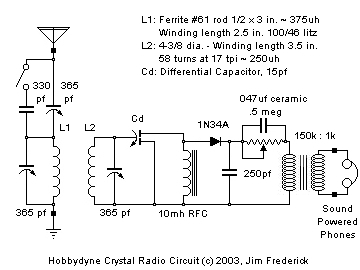 Here are a few Crystal Radio links. I will list more soon. Dave's Crystal Set Page You have to see all of Dave's sets! 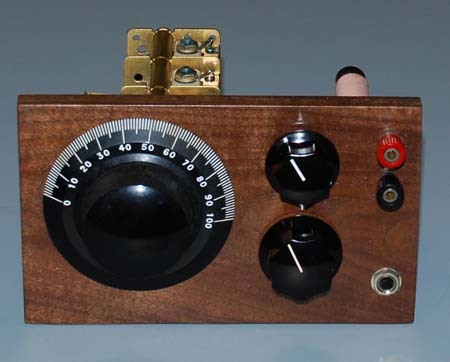 Dave's Tube Radio Page More sets from this prolific builder! Circuit Specialists Circuit Specialists carries an assortment of test equipment devices and tool that make do-it yourself projects quick and easy. 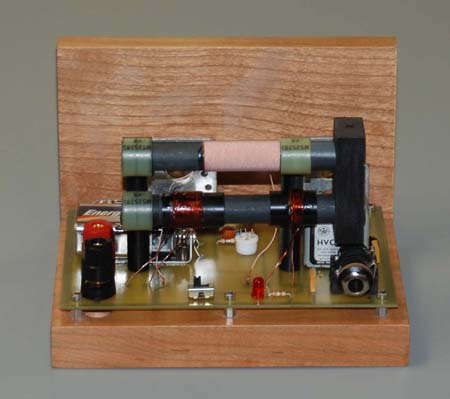 (1) I assumed that ever one knows what a Crystal Radio is. Perhaps I should explain just in case. 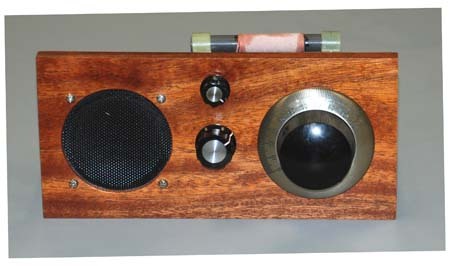 A crystal radio uses only tuned circuits to select the stations, and a crystal detector to rectify the radio station's signal to enable it to be heard with a set of headphones. It is entirely passive, it has no active components like tubes or transistors and uses no electricity. When you listen to a broadcast station on crystal radio the sound in your earphones comes directly from the station your are listening to. Since there is no amplification of any kind, the circuits, especially the coils, must be very efficient so that sufficient power can be recovered (stolen) from the station to operate the earphones. (2) Many early pioneer radio stations ran powers of many hundred thousand watts. In some areas merchants could "steal" enough power from nearby stations to light their signs. Today the maximum power permitted in the United States for commercial broadcast is 50,000 watts. In those early days the frequencies above our current AM broadcast band were consider useless and were used mostly by amateurs. All Content Copyright 2002 - 2015 Hobbytech.com.